Sauna heater 3 kW is perfect replacement heater for your sauna room. 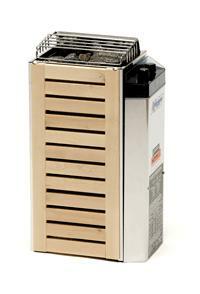 It is a part of our wide range of sauna accessories.this compact 220v sauna heater is a space saver in a small room. measuring only 12" wide x 9" deep x 25" high, it has the only built-in heater fence in the industry. unlike other heaters of its size which are light weight, the compact has heavy-duty deluxe stainless steel construction for strength and durability. other unique features are a lighted control panel at the top of the heater for easy and safe operation-it can be interchanged to left or right side of heater-and a removable tray which is attached to the bottom of the heater to catch excess water and prevent leakage of water to the floor. perfect for 0ne to two person sauna room.